MWV, the maker of AT-A-GLANCE, supports the battle against breast cancer. Since 2008 over $500,000 has been donated to City of Hope for breast cancer research, treatment and education. Pink highlighted QuickNotes® on each spread for priority data. MWV, the maker of AT-A-GLANCE, supports the battle against breast cancer. Since 2008 over $500,000 has been donated to City of Hope for breast cancer research, treatment and education. Two pages per week, one page per month. Ruled for hourly appointments. 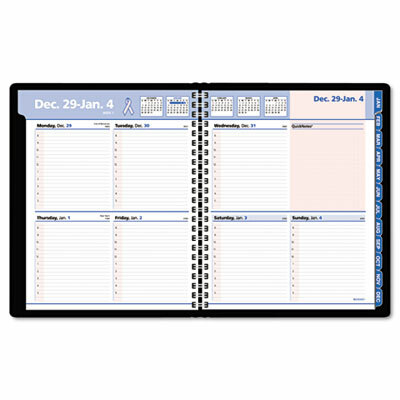 Five-month calendar reference blocks on weekly spread and eight-month on tabbed monthly overview.